Over 16,000 people committed suicide in Tamil Nadu last year. More remarkably, over 2,000 of them chose self-immolation, the most painful of deaths, by far the highest number in India. Doctors, nurses, family members—all had the same question: Did she feel the pain? Maheshwari remembers anxious faces leaning over her, peppering her with questions, even as she struggled to put together where she was and why. “No pain,” she managed to tell someone wearing a white coat and a stethoscope. He had a thick moustache and grey hair and frequently checked his phone while he spoke to her; she didn’t like that. “I don’t feel anything,” she told him, forcing her lips to form words, like dragging a spoon through heavy batter. She didn’t know why she was there, and no one would explain it to her for several days as she moved in and out of restless consciousness. Later, a nurse gently told her: You tried to commit suicide four days ago. You poured kerosene on yourself and set yourself on fire. Your brother found you and managed to put it out the fire. You have burns all over your body. Do you remember why you did it? This was in 2007 and Maheshwari was 18. Her father worked in the fish market in their adopted home of Pondicherry—they relocated from Trichy when her older brother Velan was a child—and her mother worked as a housemaid and helped out at the fish market. They were poor, but had a one-room house and managed to send their children to school. In the midst of all the tears and threats, Maheshwari went into the garden. It was a sweltering day in August of 2007, and she went alone, dressed in a red sari and carrying two things: a bottle of kerosene and a matchbox. Her hair was neatly plaited but her mother had refused to wrap jasmine around it that morning. Under the beating sun, Maheshwari poured the kerosene on herself and lit a match. Fifteen minutes later, her brother went into the garden to look for her and found her, partially engulfed with flames. Velan covers his face as he speaks about it, digging the tips of his fingers into his eyes like he’s blinding himself. Third-degree burn victims typically feel no pain in the first few days. The flames had destroyed the pain receptors in Maheshwari’s skin along with the epidermis. Her face, arms, and neck required skin grafts, and she felt no pain for six days. On the seventh day the pain returned. She says it felt like she was on fire again. In 2012-2013, 1,35,799 people committed suicide in India, according to the National Crime Records Bureau (NCRB). Maharashtra topped the list of states with the highest number of suicides, recording 16,622 deaths; Tamil Nadu was a second at 16,601. Both states’ share of total suicides in the country stood at 12.3 per cent each. This was a minor change from the previous years, when Tamil Nadu had the highest number of suicides in 2010 and 2012. The suicide rate is a better tool of comparison, given that Maharashtra has a much larger population than Tamil Nadu. The suicide rate is defined as the incidence of suicides per 1,00,000 population. In 2013, Pondicherry held the highest suicide rate of 35.6. Maharashtra’s was 14.3 and Tamil Nadu’s was 24.3. The national average rate stood at 11. In 2013, 9,964 people across the country committed suicide by fire/self-immolation. Of these, 6,692 were women, over 63 per cent of the total. Tamil Nadu accounted for 2,098 self-immolation deaths—over 20 per cent of all self-immolation deaths in the country—the highest for a state, making it India’s self-immolation capital. Out of the total suicides in Tamil Nadu, 12.6 per cent were by self-immolation. Women accounted for 1,261 deaths making up 60 per cent of all self-immolation deaths in the state. There is no record of the number of people try to immolate themselves, but professionals dealing with such cases say the number would be many times over the reported cases. Hanging is the most common method of suicide; 39.8 per cent of all suicides in the country happen through hanging. This is followed by poisoning at 27.9 per cent. Self-immolation owns 7.4 per cent of the total and is the third largest method adopted. A break-up of these cases based on reasons is unavailable. Popular conception is that most self-immolation deaths are driven by activism; SCRB officials and hospital staff say this is untrue. Tamil Nadu’s culture and literature hold a special place for self-immolation: death by fire forms a chapter in itself. Numerous stories build the narrative of fire as a cleansing spirit, fire as a form of protest, fire as a statement of intent and finality. D. Jayakumar is a professor of Tamil literature in Chennai, and one of his pet subjects is self-immolation. About 55 years old, with a tidy grey beard and a high forehead, he says that history has been versionised to speak of self-immolation with reverence. He says this overwhelmingly female influence is mirrored in statistics today. Unlike all other methods of suicide, more women than men die in self-immolation. In India; over 63 per cent of victims are female. It’s 8 a.m. at the burn ward at Royapettah General Hospital in Chennai—the city’s largest peripheral hospital—and the small square room is already bustling with activity. The waiting room is already full of family members and patients on follow-up visits—several people squat on the floor, fanning themselves vigorously. Two patients have been brought in for treatment an hour ago—one for accidental burns received from a house fire and the other for third-degree burns after a gas explosion at home—and the air is heavy with the smell of Dettol and antiseptics. Ramkumar Kathirasan is the doctor on duty today. At 62 years old, he’s seen thousands of patients pass through the hospital’s portals, and he says at least one in 10 of his patients have self-inflicted burn wounds. The skin has many layers and damage is based on the intensity of the burn. The epidermis is damaged in a first-degree burn: something similar to sunburn where the skin reddens and is tender, but there is no severely wounded tissue. Second-degree burns affect the entire epidermis, leading to blisters and reddening of the skin which varies in intensity depending on the extent of damage. Healing takes time but usually occurs with minimal scarring after two weeks. A third-degree burn destroys the entire epidermal layer. Pain receptors are often destroyed— which is why many victims initially feel no pain—along with blood vessels and skin glands. As the burn penetrates, most victims face acute loss of fluid and their metabolic rates are affected. The body is unable to repair the damage itself, requiring skin grafts and surgery. In rare cases, bone and muscle are damaged, which, in some cases, is inoperable. This burn is also called full thickness: the skin is damaged to an extent that it becomes thick and leathery. According to news reports, the government is in the process of repealing Section 309. Early last month, the Home Ministry circulated a note to all states on effacing the section, and is currently waiting for their responses. In October 1984, M. G. Ramachandran—the man the people of Tamil Nadu called their son, father, and brother all in one—fell ill. His kidney failed on October 6, followed by a mild heart attack and then a stroke on October 16. He was flown to Brooklyn, New York, for treatment. MGR would return to India in February the following year, after going through a kidney transplant in December, but public sentiment was so absolutely tipped in his favour that hysteria broke out. Fans poured onto the streets, weeping in terror, fearing the death of the beloved leader. As the hysteria peaked, over 100—according to news reports at the time—attempted self-immolation. 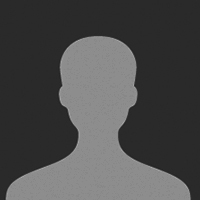 One of the hundred was a slim 21-year-old called Manivannan. He had been a cheerful young man, revelling in unemployment, who—like most men of that background—liked nothing more than getting together with his group of friends. He also had one major weakness: MGR. In 1968, five-year-old Manivannan had watched Pudhiya Bhoomi, the story of MGR as an honest and upright surgeon, co-starring Jayalalithaa and Nambiar. Over the years, he would watch every single MGR movie that came out, most of them dozens of times each in the theatre. “His favourite movie was Rickshawkaran,” says his younger sister Vedavalli. “He must have watched it over 50 times.” Rickshawkaran came out in 1971 and became one of MGR’s most identifiable films—a man of the masses, a rickshaw driver, in search of justice. Manivannan and two of his friends would set themselves on fire in a playground nearby. They were taken to a hospital by passersby. The two friends survived. Manivannan died two months later on December 21, just days after MGR received his kidney transplant. She sits straight in her chair—a tall, broad-shouldered woman in her early 40s with skin stretched tight across her face. The room is impeccably clean: an aged television set, stacks of Tamil magazines on the table, framed photographs of her, her husband and their two children taken at a photo studio. She is clearly restless to get back to her household work, keen on ending this conversation she does not want to have. Self-immolation is more immediately recognised as death for protest; from Telangana to Tibet, activists have set themselves on fire for the recognition of a cause. In 2013 last year, a 30-year-old man burned himself to death in Tirupur to demand that the Arunthathiyars be given six per cent sub-quota within the 18 per cent reservation for Dalits in Tamil Nadu. Tamil Nadu in 1965 saw scores of activists set themselves on fire in protest against Hindi being imposed as the national language, starting with a labourer called Chinnaswamy in 1964. In 1986, Karunanidhi’s arrest for reviving the anti-Hindi agitation resulted in 21 people committing suicide, most of them through self-immolation. Government packages on “compassionate grounds” to families of victims only drove the number higher, as poverty and unemployment was rampant. Piece by piece, over the years, the state has put together a self-immolation movement driven by political loyalty, protest and desperation. Accounts of these self-immolations on the Internet frequently use words like “glorious” to describe this struggle by Tamilians; many of the people who died are celebrated as martyrs who died for a cause. Posts on websites describe victims as “honourable and brave”. Psychiatrists suggest that higher levels of literacy in southern states could be a driving factor for suicides: with education comes expectation, and therefore disappointment. Another reason suggested is lower levels of aggression in the southern state as compared to the north, leading to an internalisation of problems, and therefore suicide. She also wrote that according to two studies in rural Tamil Nadu, the annual suicide rate is six to nine times the official rate. It was left to Velan and his uncle Murugan to take Maheshwari home. She would not speak much or spend much time around people. A burn mark travelled from her left temple across her cheek and down her chin to her neck: red, raw and, to her, horrifyingly conspicuous. She had lost most of her hair. “When we were taking her to the hospital, my mother tried to pat her on the head and the hair just came off in her hand,” says Velan. In December 2007, four months after her first attempt, Maheshwari set herself on fire. Her parents, Velan and Murugan were at work; only her 12-year-old sister Kamakshi was in the house. She went into the garden—“I wanted to go to the same place”—and emptied two bottles of kerosene onto herself. Her sister and neighbours heard her screams almost immediately. The Social Welfare and Nutritious Meal Programme department under the government of Tamil Nadu lists a number of schemes for “the mentally retarded”, in its words, mostly maintenance allowances for “mentally retarded persons with 60 per cent disability and above”. The Health and Family Welfare department details state and district-wide mental health missions to normalise mental health as an issue, and increase literature and knowledge on the topic. Very little exists outside of paper. Officials at the health department at the Secretariat in Chennai are bewildered when asked about Tamil Nadu’s high suicide rate, and about the need to provide counselling and treatment to those who attempt suicide. Two officials even suggest that this issue might come under the purview of the Chennai Corporation. On a national level, amendments to the Mental Health Care Bill, 2013, were approved by the Union Cabinet in January this year. The bill seeks to decriminalise suicide—saying “Notwithstanding anything contained in section 309 of the Indian Penal Code, any person who attempts to commit suicide shall be presumed, unless proved otherwise, to be suffering from mental illness at the time of attempting suicide and shall not be liable to punishment under the said section”. Gayatri is 41 years old, a sleepy-eyed, tall woman with a slow, strangely comforting voice, her consonants long and enunciated. A psychologist by education but not practice, she volunteers at a national suicide prevention helpline, taking phone calls for two hours a day, five days a week. Maheshwari sits across the table in her brother’s house, seven years later. She is wearing a pale blue polycotton sari printed with cheerful green flowers, the likes of which have never been seen on tree or plant. Her hair is thick and coarse and pulled into a tidy bun at the nape of her neck. Two morams (strings) of jasmine are wrapped around it. Her hands are spread on the tabletop, palms pressed down, and the skin on her hands is patchy and discoloured. The scar from left temple to neck remains, with a darker, deeper scar now on her right cheek. The skin on her forearms and stomach peeled off in strips, and the grafts are clearly visible: a patchwork of light and dark skin. The shape of her face has changed—the thick, leathery patches from her burns altered the contours of her cheeks, jaw and nose. Both arms and legs lost tissue and muscle in the burns, and she moves slowly and carefully, every movement calculated. Why did she choose fire? Under pressure from the doctors at JIPMER, Maheshwari met with a psychologist attached to the hospital for the first three months after she was discharged. She is vague about what she discussed. is a former copy editor at Fountain Ink. 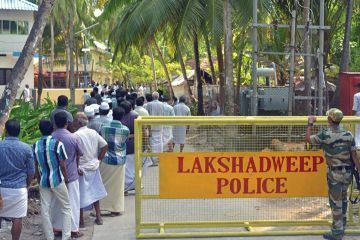 Lakshadweep’s link with democracy is tenuous, and its isolation a deliberate instrument of government policy. 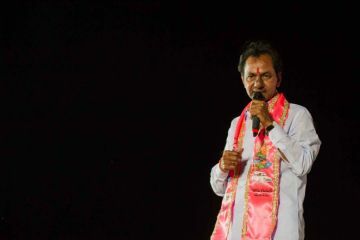 The story of K. Chandrashekar Rao: opportunist, defector, demagogue, tyrant, and the chief architect of Telangana. 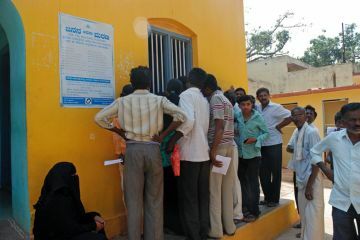 India’s land record system is synonymous with delays and corruption. Karnataka’s Bhoomi Project shows the way.